Hey, remember that Geocities torrenting thing? OK, so right now no person outside of myself has the full copy of the Geocities torrent actually torrenting. Let me explain why and show the roadmap to fixing that. Essentially, the problem is that my internet connection isn’t what it used to be – I used to have some pretty sweet 20/20 FiOS (which I used constantly) and right now the main connection is a hysterically crappy cable modem. Bear in mind that a lot of my downloads now go to servers already out there in the wide world, on good connections – but the personal connection is rather undependable and slow. I’ve been direct uploading to a non-publicized location so that my seeds can use that data. but so far we’re only halfway done. So the torrent is halfway done. I’ve had to watch an awful lot of people come up with completely crazy conspiracy theories as to why the seed is only halfway there, and that’s the reason – there’s only currently half to pull from. In two cases, people mailed me hard drives, I put a full copy on there, sent them back… and guess what. No seed showing up on the torrent. Oh well. More people are sending me drives, so if nothing else, be aware this copy is in more than one place already and will be in even more places shortly. I’ve been looking for a place with a huge upstream to maybe bring a laptop with USB drive to to flush things out, but that hasn’t been successful quite yet. If you’re in the NYC area, have an insane upstream pipe, and feel like having a houseguest for a few hours, let me know. 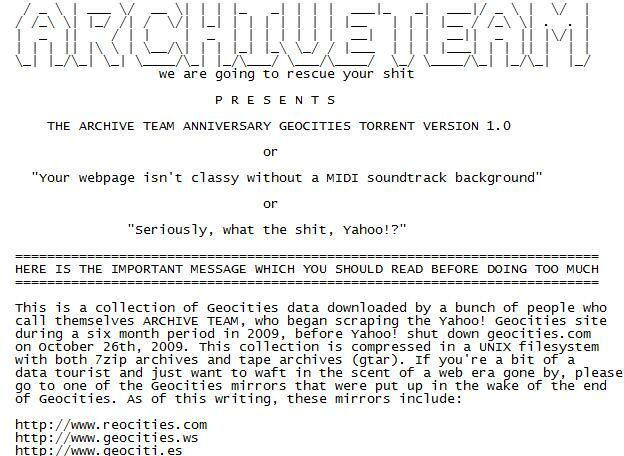 But the upshot is, don’t worry – I plan to have all of the geocities torrent passing around very soon in 2011. It’s all working. And where was everyone worrying about their geocities warez in 2009, anyway? More archive team fun is happening shortly – I’ll keep you posted. Go Jason! Don’t let small difficulties shorten your enthusiasm! Hope you get a better internet connection soon. Thanks Jason! Sorry the hear the first round of hard drives didn’t work out. I appreciate the effort! I’m one of the people that mailed you and is still trying to get the data – almost gave up because you didn’t post any updates…. I’m too far away from you to send hard drives otherwise. Anyway, I doubt you’ll have too many seeders even after you do that, because the torrent is bad – some of the files have the same name but with uppercase and lowercase so I personally have to disable those files and files before and after these “bad” files, simply to prevent the client from thinking there are disk write errors. I would seed the 99% of the torrent, meaning everything except those files. Ubiquityservers.com rents dedicated servers in New York, see their offer here webhostingtalk.com/showthread.php?t=1006725 The footer of that post has contact information including a phone number. Maybe you could pay something like 20-50$ for an engineer of theirs to plug your drive in one of their spare servers and transfer the data to your server. Another company that advertises services in New York is dedidirect.com but I don’t know them – the previous company has some good “reputation” on that website. Are you still accepting hard drives to help with the seeding? Marius: The conflicting filenames does not make the torrent ‘bad’ – just annoying to deal with on Windows. If you have a good torrent client (like uTorrent) then you can relocate the offending files into another directory and everything will proceed normally. 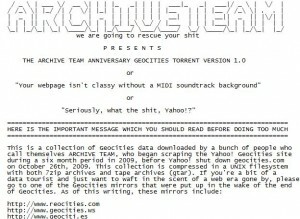 I posted a list of the offending files in the talk section of the GeoCities Wiki page on the archiveteam wiki. For the record, the problem is that Windows deliberately doesn’t distinguish between upper and lowercase in filenames for backwards compatibility reasons that stretch all the way back to DOS. Unfortunate, but understandable – if at any time Microsoft had started to distinguish case, all hell would have broken loose as everyone and their monkey accused MS of deliberately breaking stuff. Jason, in future torrents, if you could check for and avoid this situation, it would be appreciated. It does take one some time to figure out that the ‘disk errors’ are really just the result of file naming issues. I just commented on the previous Torrent topic. Thanks for the update and: great work. O, and if you like and think that it is useful: I can also mail you a drive and help to seed from here. Michael, for me the torrent is bad but not broken – maybe we have different conceptions of the meaning of the word “bad”. For me a bad apple can be eaten but it doesn’t taste well or some small part of it is damaged while a rotten apple is “unusable”. I know the technical stuff – NTFS file format, Windows and so on, I get that and I know in Linux this is perfectly OK. Jason should have just paid a bit more attention to it, as now this will hamper the seeding process for many. Yes, you can go around those files but in reality it’s more complex than just selecting those particular files – you have to keep in mind some of those files with issues have a size of less than 16 MB (the piece size) so in one 16 MB size, uTorrent will download about 5 of those small files, including both versions of the file with the same name. It needs to download the whole chunk to verify the validity of the piece so once it downloads the pieces it will get confused and read the same file twice and ignore the file with the other name, causing the piece hash check to fail with an error. And when this happens, uTorrent goes into checking the whole 2-300 GB of content already downloaded which takes about 40 minutes. I noticed the windows filename collision problem a little while ago, and after a bit of expletion moved the files over to a torrent manager on one of my linux boxes. I’ve been sharing for over a month now, have 35/35 FiOS, and will seed for at least a year after completion. Just gotta push it all up your wire to us, us good seeders are out here waiting (patiently) to magnify your effort. What a local dataset to work with! So much fun. Now I can have the largest collection of animated gifs known to man. Note: Some of your “crappy” cable modem performance may be bufferbloat. It is still not needed yet? Sweet, I see it’s started moving again. Granted, don’t use anything else but some Unix clone with a reasonable file system to handle it. I think Jason clearly wrote in his readmes that Unix is expected. And of course I am waiting for the torrent to complete. I will seed it as long as the harddisk is spinning. For those of you still paying attention to this thread, I (along with several other people) got a drive to Jason at Shmoocon. As soon as I see the drive hit my doorstep (RSN, right Jason?) I’ll be attaching as a seed to the torrent. WOW, the torrent is pouring in! So, who has the last 3%? I promise to seed for at least a year! Any updates on this torrent?